Microservices have become the hottest topic in software architecture over the past year, and much can be said about their benefits. However, it’s important to understand that as soon as we start decomposing the monolith, we enter the realm of distributed systems. Anyone who is familiar with The Eight Fallacies of Distributed Computing knows that such systems are fraught with danger, and making any of the eight assumptions will eventually lead to disastrous consequences. If I were to sum up these fallacies in one sentence it would be the following: Any expression of consistency or reliability in a distributed system is a lie. We have to assume that the behavior and the locations of the components of our system will constantly change. Two consequences of this: Components will sometimes provide poor quality of service or outright disappear, and we can bucket these under the general term of faults. Faults, if not handled properly, can cause failures, meaning the system no longer provides the service it was designed to provide. Therefore, in order to enjoy the benefits of microservices (loose coupling, autonomous services, decentralized governance, easier continuous delivery, and so on), we must avoid the situation whereby a single fault cascades into a system failure. Joe Armstrong, the father of Erlang, gave a great talk on this topic titled Systems that Run Forever, Self-Heal, and Scale. In it he describes systems that look a lot like what we call microservices, but with emphasis on fault-tolerant systems that self-heal. What does it take for us to build such systems? As we decompose the system into many distributed processes, how do we consistently and reliably distribute configuration to these processes? When that configuration needs to change, how do we update that configuration without redeploying all of the processes? In a system like this, particularly one deployed in a cloud environment, processes will come and go and change their locations (especially as they recover from faults). How do we determine the locations of the processes that my process needs to collaborate with? Once we’ve determined a set of possible locations of one of my process’s dependencies, how do we choose which process instance to communicate with next? Suppose, in the span of time between choosing a process instance and communicating with that instance, the instance suffers a fault. How do we prevent that fault from cascading into a failure? How do we maintain visibility into the composite behavior of the system that emerges from the evolving topology of autonomous services so that we can make adjustments? As it turns out, you can deploy several boilerplate patterns and open source tools to mitigate these challenges. Netflix built many of these components, battle tested them in production, and open-sourced them. In theory, we can leverage these tools to build systems that “run forever, self-heal, and scale.” For us remains the task of understanding the patterns; understanding the Netflix components that implement them; then deploying, managing, and integrating with these components. Taking on new technology dependencies always introduces additional complexity into any software engineering endeavor, so some of us might hesitate to adopt the Netflix stack. The Spring engineering team has throughout its existence attempted to build powerful weapons for the war on Java complexity. Our early focus was on removing the shackles of J2EE that inhibited the productivity of the enterprise application developer. These days that focus has shifted to enabling the construction of cloud-native applications, with much of the work done in and around a project we call Spring Cloud. The goal of Spring Cloud is to provide the Spring developer with an easily consumable set of tools to build distributed systems. It primarily does this by wrapping other implementation stacks, starting with the Netflix OSS stack. These stacks are then consumed via the familiar tools of annotation-based configuration, Java configuration, and template-based programming. Let’s take a look at a few of Spring Cloud’s components. Spring Cloud Config Server provides a centralized configuration service that is horizontally scalable. It uses as its data store a pluggable repository layer that currently supports local storage, Git, and Subversion. By leveraging a version control system as a configuration store, developers can easily version and audit configuration changes. Configuration is represented as either Java properties or YAML files. The Config Server coalesces these files into environment objects, which present the well-understood model of Spring properties and profiles as a REST API. This REST API can be queried by any application directly to obtain configuration data, but an intelligent client-side binding can be added to Spring Boot applications that will automatically reconcile any local configuration with configuration received from the Config Server. The Spring Cloud Config Server is a powerful mechanism for distributing configuration consistently across a set of application instances. However, as it stands, we are currently limited to updating such configuration only on application boot. After pushing a new value for a property to Git, we would need to manually restart each application process to obtain the new value. What we’d like is the ability to refresh the application’s configuration without a restart. App A requests the latest configuration from the Config Server. Any Spring Beans annotated with @RefreshScope are reinitialized with the new configuration. App A sends a message to the AMQP exchange indicating it has received a refresh event. 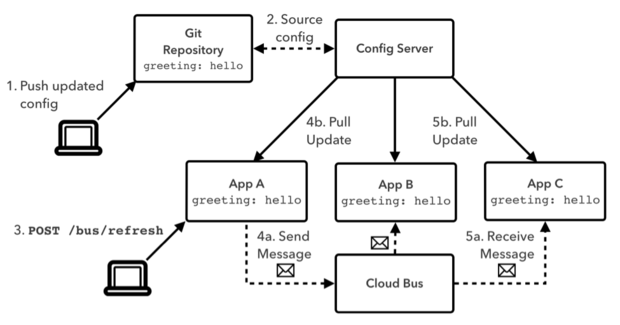 Apps B and C, participating on the Cloud Bus by listening to the appropriate AMQP queue, receive the message and update their configuration in the same manner as App A. Now we have the ability to refresh an application’s configuration without a restart. Spring Cloud Netflix provides wrappers around several Netflix components: Eureka, Ribbon, Hystrix, and Zuul. I’ll discuss each of these in turn. Eureka is a resilient service registry implementation. 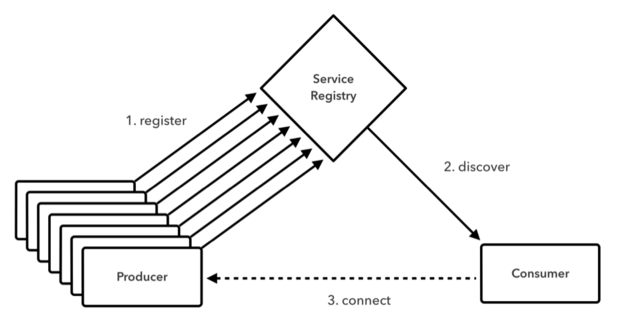 A service registry is one mechanism for implementing the Service Discovery pattern (Figure 3). Spring Cloud Netflix enables the deployment of embedded Eureka servers by simply adding the spring-cloud-starter-eureka-server dependency to a Spring Boot application, then annotating that application’s configuration class with @EnableEurekaServer. Applications can participate in service discovery by adding the spring-cloud-starter-eureka dependency and annotating their configuration class with @EnableDiscoveryClient. This annotation provides the ability to inject a properly configured instance of DiscoveryClient into any Spring Bean. DiscoveryClient is an abstraction for service discovery that in this case happens to be implemented via Eureka, but can also provide integration with alternative stacks such as Consul. The DiscoveryClient is able to provide location information (such as network addresses) and other metadata about service instances registered with Eureka by those service’s logical identifier. The load balancing provided by Eureka is limited to round robin. Ribbon provides a sophisticated client-side IPC library with configurable load balancing and fault tolerance. Ribbon can be populated with dynamic server lists obtained from a Eureka server. Spring Cloud Netflix provides integration with Ribbon by adding the spring-cloud-starter-ribbon dependency to a Spring Boot application. This additional library provides the ability to inject a properly configured instance of LoadBalancerClient into any Spring Bean, which will enable client-side load balancing (Figure 4). Among other tasks, using Ribbon enables additional load balancing algorithms such as availability filtering, weighted response times, and availability zone affinity. Hystrix provides an implementation of common fault-tolerance patterns for distributed systems such as circuit breakers and bulkheads. Circuit breakers are normally implemented as a state machine, an example of which is found in Figure 5. Circuit breakers can be placed between services and their remote dependencies. If the circuit is closed, calls to the dependency pass through normally. If a call fails, that failure is counted. If the number of failures reaches a threshold within a configurable time period, the circuit is tripped to open. While in the open state, calls are no longer sent to the dependency, and the resulting behavior is customizable (throw an exception, return dummy data, call a different dependency, and so on). Periodically the state machine will transition into a “half open” state to determine if the dependency is healthy again. In this state, requests are again passed through normally. 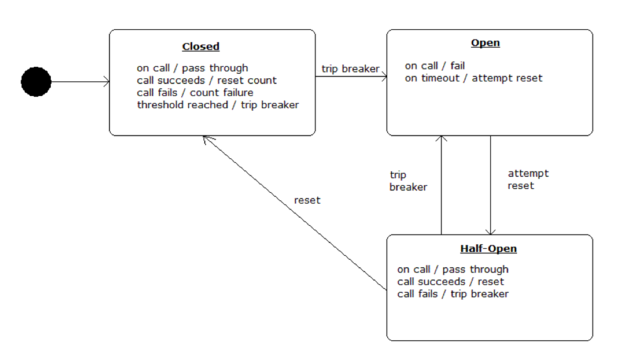 If the request succeeds, the machine transitions back to the closed state. If the request fails, the machine transitions back to the open state. In addition to providing the state machine behavior, Hystrix also emits a metrics stream from each breaker providing important telemetry such as request metering, a response time histogram, and the number of successful, failed, and short-circuited requests (Figure 6). Zuul handles all incoming requests to Netflix’s edge services. It is used in combination with other Netflix components like Ribbon and Hystrix to provide a flexible and resilient routing tier for Netflix services. Authentication and security: Identifying authentication requirements for each resource and rejecting requests that do not satisfy them. Insights and monitoring: Tracking meaningful data and statistics at the edge in order to give us an accurate view of production. Dynamic routing: Dynamically routing requests to different back-end clusters as needed. Stress testing: Gradually increasing the traffic to a cluster in order to gauge performance. Load shedding: Allocating capacity for each type of request and dropping requests that go over the limit. Static response handling: Building some responses directly at the edge instead of forwarding them to an internal cluster. Multiregion resiliency: Routing requests across AWS regions in order to diversify our ELB usage and move our edge closer to our members. In addition, Netflix leverages the capabilities of Zuul to perform surgical routing and stress testing via canary releases.